7 November 1945: Wing Commander Hugh Joseph Wilson, A.F.C. 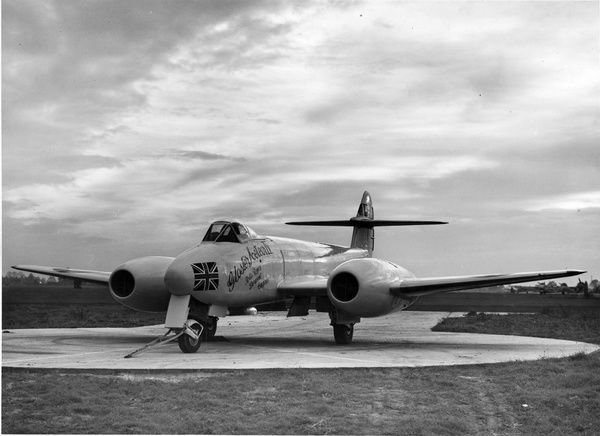 and Two Bars, Royal Air Force, Commandant of the Empire Test Pilots’ School at RAF Cranfield, set the first world speed record with a jet-propelled airplane, and the first speed record by an airplane in excess of 600 miles per hour (965.606 kilometers per hour), when he flew the Gloster Meteor F Mk.IV, EE454, to 975.68 kilometers per hour (606.26 miles per hour)—0.80 Mach—at an altitude of 75 meters (246) above Sea Level. 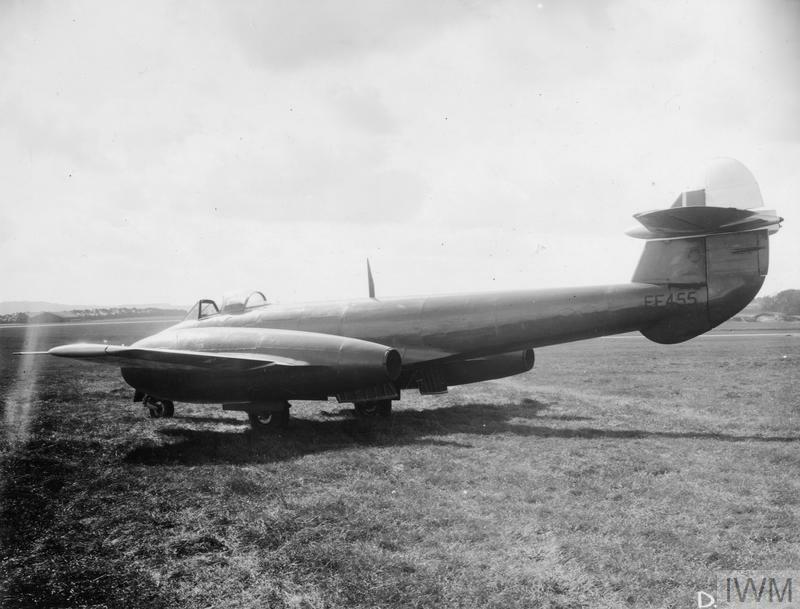 Months of preparation by both the Royal Air Force, which formed a special “flight,” and Gloster Aviation Co., Ltd., went into the speed record effort. 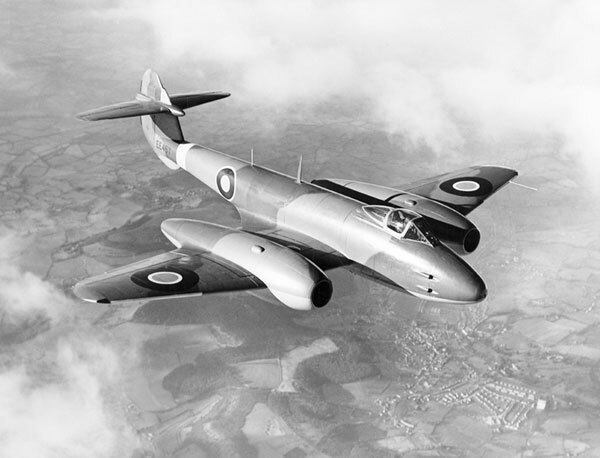 Two Meteor F Mk.III fighters, EE454 and EE455, were modified to the new Mk.IV version to attempt the speed record. The standard B.37 Rolls-Royce Derwent Series I turbojet engines were replaced with Derwent Series V turbojets and lengthened jet nacelles. The wings were shortened, the tips reshaped and the canopy was cut down and strengthened. All trim tabs on flight control surfaces were disabled and their edges sealed. Landing gear and gear door up-latches were strengthened to prevent them from being sucked open at high speed. The airplanes were lightened and all armament deleted. The surfaces were smoothed and painted in a gloss finish. EE454 retained the standard camouflage pattern, while EE455 was painted in a distinctive yellow-gold color. Many hours of flight testing were performed to ensure that the airplanes would be stable enough at high speeds while flying at the very low altitude required by the Fédération Aéronautique Internationale‘s rules. The slightest deviation from smooth flight could have disastrous results. 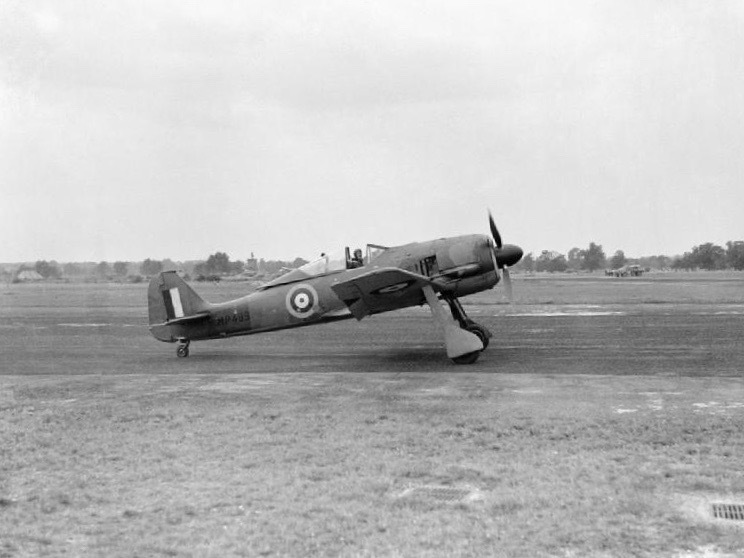 EE454 was flown by Wing Commander Hugh Joseph Wilson, A.F.C. 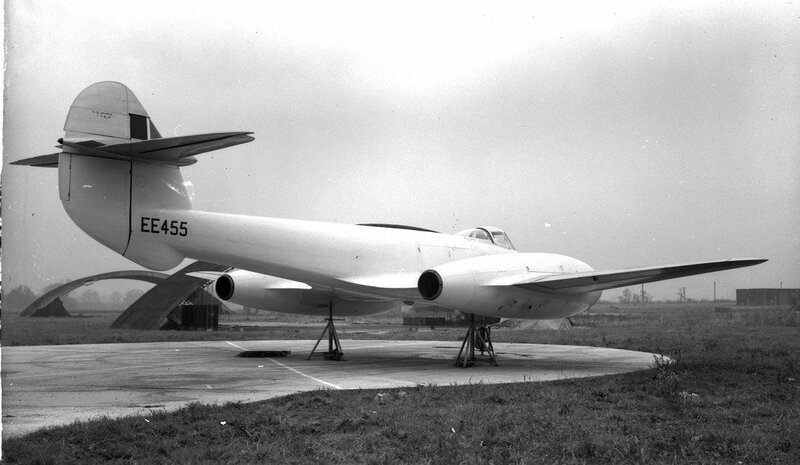 and Two Bars (three awards), and EE455 by Gloster Chief Test Pilot Eric Stanley Greenwood. Each airplane was required to make four passes over the 3 kilometer (1.8641 statute miles) course, with two runs in each direction. The airplanes were required to remain at or below 75 meters (246 feet) during the runs over the course, and during the turns at the end of each run, below 400 meters (1,312 feet). On the day of the speed runs, the weather was marginal. It was cold and overcast, and visibility varied from 7 to 12 miles 11–19 kilometers) along the course. The wind was 8–12 miles per hour (3.6–5.4 meters per second) from the northwest. Wilson made four passes over the course. His speeds for each run were 604, 608, 602 and 611 miles per hour (972, 978, 969, and 983 kilometers per hour). Greenwood made his speed runs an hour later. His runs were 599, 608, 598 and 607 miles per hour (964, 978, 962 and 977 kilometers per hour). Wilson’s average speed was the higher of the two. His official FAI-homologated record speed is 975.68 kilometers per hour (606.26 miles per hour). Post-flight inspections revealed that the sheet metal of the Meteors’ engine intakes had significantly distorted by the intense pressure differentials experienced during the speed runs. The B.37 Rolls-Royce Derwent Series V, interestingly, was not a direct development of the preceding Derwent Series I–IV engines. Instead, it was a scaled-down version of the RB.41 Nene, which was in turn, a scaled-up and improved Derwent I. The Derwent V had a single-stage, two-sided, centrifugal-flow compressor and a single-stage axial-flow turbine. The compressor impeller and turbine rotor were mounted on a single shaft which was supported on each end by roller bearings, and in the center by a ball bearing. The Derwent V used nine combustion chambers, and burned aviation kerosene. Engine lubricating oil was added to the fuel at a 1:100 ratio, by volume. The Series V had a Normal Power rating of 3,000 pounds of thrust (13.345 kilonewtons) at 14,000 r.p.m., and a Take-off or Military Power rating of 3,500 pounds of thrust (15.569 kilonewtons) at 14,600 r.p.m. (There was no time limit for this power setting.) The engine produced a maximum 4,000 pounds of thrust (17.793 kilonewtons) at 15,000 r.p.m. at Sea Level. During the speed runs, thrust was restricted to 3,600 pounds (16.014 kilonewtons) on both Meteors. The Derwent V engine was 7 feet, 4.5 inches (2.248 meters) long, 3 feet, 7 inches (1.092 meters) in diameter and weighed 1,280 pounds (581 kilograms). Group Captain Wilson was born at Westminster, London, England, 28 May 1908, the only son of Alfred Wilson and Jessie Wood Young Wilson. He was educated at the University School, Hastings, and the Merchant Taylors’ School, London. Wilson received a short service commission as a Pilot Officer in the Royal Air Force, 13 September 1929 and was assigned to the No. 5 Flight Training School, at RAF Sealand, Flintshire, Wales. Pilot Officer Wilson was then assigned to 111 Squadron at Hornchurch, Essex, 1930–1932. He was promoted to Flying Officer, 13 March 1931. From 1932 to to 1934, “Willie” Wilson was assigned to the School of Naval Co-operation and Air Navigation at Lee-on-Solent, Hampshire. On the completion of his five-year short service, Wilson was transferred to the Reserve Air Force Officers list. He qualified in flying boats and acted as a flight instructor for the RAF Reserve School. Wilson was promoted to Flight Lieutenant 1 April 1937, with seniority retroactive to 1 April 1936. Flying Officer Hugh Wilson in the cockpit of a prototype Blackburn Roc fighter, RAF Northolt, 22 May 1939. 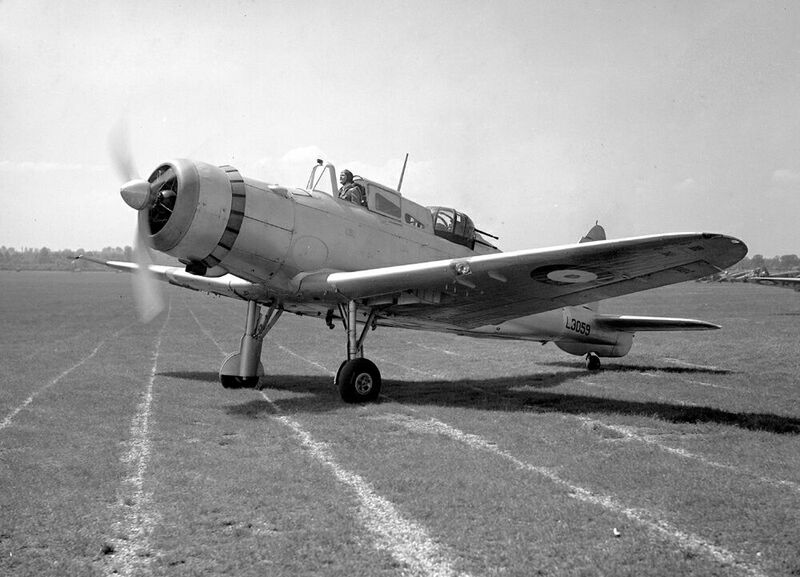 While a reserve officer, Wilson was a test pilot for Blackburn Aircraft Ltd., and made the first flight of the Blackburn Roc. He then became a civil test pilot at the Royal Aircraft Establishment, Farnborough. In 1939 Flight Lieutenant Wilson was recalled to active duty. He was assigned as Commanding Officer, Aerodynamic Flight, RAE Farnborough, and also flew with No. 74 Fighter Squadron at Biggin Hill. On 1 September 1940, Wilson was promoted to the rank of Squadron Leader. In 1941, Wilson was appointed chief test pilot at the Royal Aircraft Establishment and was responsible for testing all captured enemy aircraft. He was promoted to Wing Commander, 20 August 1945. Wing Commander Hugh Joseph Wilson, A.F.C. 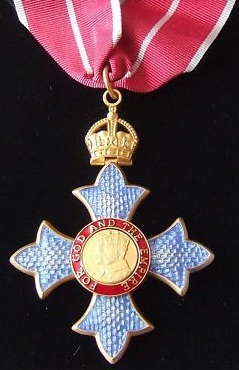 and Two Bars, Royal Air Force, was named Commander of the Most Excellent Order of the British Empire (C.B.E.) in the King’s Birthday Honours List, 13 June 1946. On 22 February 1947, Wing Commander Wilson married the former Thom Isobel Moira Sergeant (Mrs. Moira Garnham). They had one son. On 4 December 1959, he married Miss Patricia Frances Stanley Warren. They had two children. 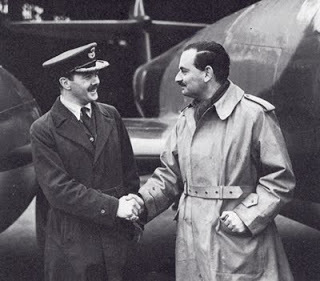 Wing Commander Hugh J. Wilson retired from the Royal Air Force at his request 20 June 1948, with the rank of Group Captain. He died at Westminster, London 5 September 1990 at the age of 82 years. 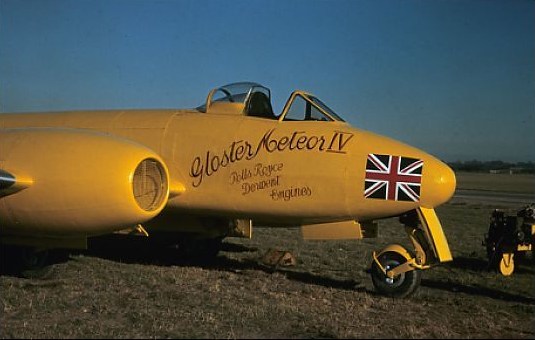 Gloster Chief Test Pilot Eric Stanley “Terry” Greenwood (29 November 1908–February 1979) was the first pilot to exceed 600 miles per hour, while test flying the Meteors. He was appointed an Officer of the Most Excellent Order of the British Empire (O.B.E.) in the King’s Birthday Honours List, 13 June 1946.